Since the tragedies at Marjory Stoneman Douglas High School in Parkland, Florida, the March For Our Lives movement has taken a stand against senseless gun violence. The Parkland students work together with young leaders of all backgrounds from across the country to hold politicians accountable and combat the normalization of gun violence. March For Our Lives brings survivors of the Parkland shooting to San Diego to share Glimmer of Hope, a the New York Times bestselling book by the founders of the movement that tells the story of how a group of teenagers raced to channel their rage and sorrow into action—and went on to create one of the largest youth-led movements in global history. These students bring their urgent conversation to San Diego, offering us a chance to come together and take action, refuse to remain passive, and work to create a safe and compassionate nation for our youth. 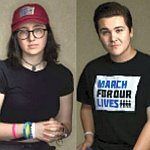 Featuring Parkland Shooting survivors Sofie Whitney and Brendan Duff. Price: FREE to the public, but tickets will be required to enter. One ticket per person allowed. Open to All Ages.